Celebrate the legacy of Martin Luther King Jr. on January 15th from 2 – 5pm at one of New York State’s richest historic heritage sites. Come meet and listen to three incredible authors – Brenda Ross, Tiffany Jackson and Hugh B. Price – each with a powerful narrative about the African American experience. 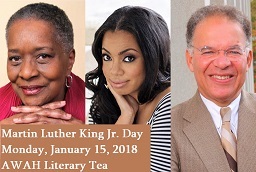 This Annual Literary Tea is organized by the American Women of African Heritage (AWAH) and will be held at the Jay Heritage Center for the 4th consecutive year. Tickets are $65 each. Contact [email protected] or [email protected] for further information. The Jay Estate is a proud member of Westchester County’s African American Heritage Trail and New York State’s Path Through History for Civil Rights. Tickets are $65 each. Contact [email protected] or [email protected] for further information.